This weekend marks the 100th Anniversary of the World War I poem “In Flanders Fields”. This poem was written by Canadian physician and poet Lieutenant Colonel John McCrae on May 3, 1915, as a tribute to his fallen friend, Alexis Helmer, who was killed at the Second Battle of Ypes. Canadian forces lost 5,975 men in this battle that marked the first use of poison gas by the German army. According to legend, McCrae threw away the poem, but it was rescued from obscurity when fellow soldiers retrieved it from a wastebasket. The poem is popular as one of the memorial statements for WWI particularly in Canada. McCrae never returned home as he died of pneumonia near the end of the war. The poem was published in the British magazine Punch seven months later, and its references to the red poppies that grow on the fields of battle where soldiers fell gave rise to the “remembrance poppy.” Sales of remembrance poppies, usually made of silk, were used to fund war bonds, and after WWI, continued to be sold to fund veteran’s programs. 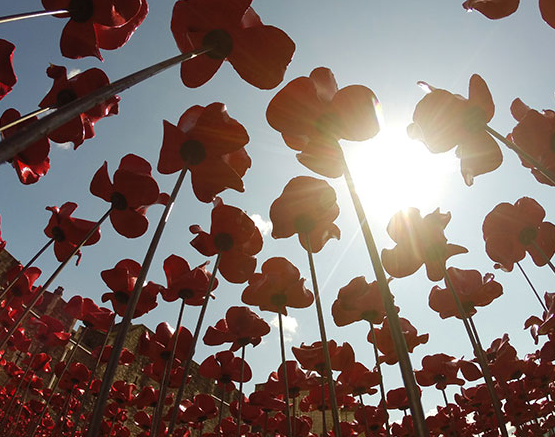 This past year (August-November 2014), a total of 888,246 ceramic kiln-fired remembrance poppies, hand formed by artists, were planted on the grounds of the Tower of London. Each of the poppies represented a British soldier killed during WWI. The Tower Remembers Project website hosts videos on the creation of the poppies, which are the brainchild of artists Paul Cummins and Tom Piper. 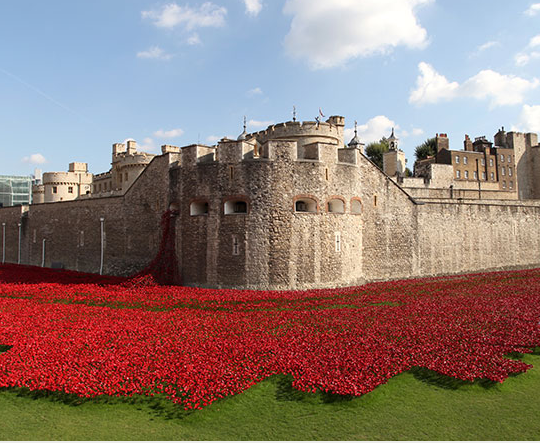 The exhibit called Blood Swept Lands and Seas of Red was installed at the Tower of London, in order to mark the one hundred year anniversary of Britain’s engagement in the First World War. The ceramic poppies were sold and the proceeds split between six different charities, all associated with supporting veterans of war. The poem also inspired the In Flanders Field Museum in Ypes, Belgium. In the museum, the poppies are on bracelets with imbedded RFID-chips that allow the wearer to read the personal stories about the war, filmed monologues and aerial photography. Here in the United States, the American Legion adopted the poppy as their official symbol of remembrance in 1920 through the efforts of University of Georgia Professor Moina Michael.